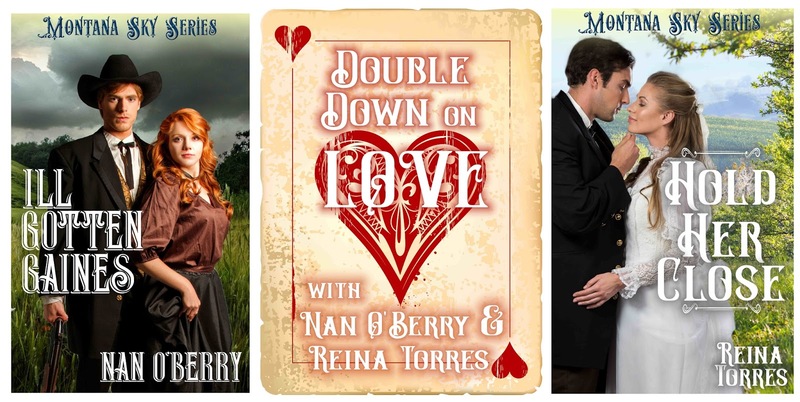 When it was announced that the Winter release for Montana Sky Kindle World was going to be 'pairs of stories' released week after week, I was happy to have Nan O'Berry release on the same day with me. Nan & I write the "Three Rivers Express Series" set during the time of the Pony Express in Wyoming Territory 1860-1861. We thought it might be fun to link out stories up from the opening scene. 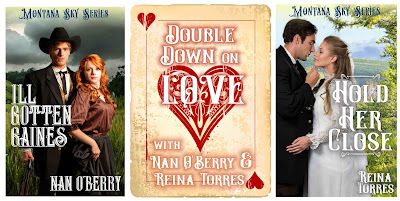 Both books start during a long night of gambling where my hero, Perceval "Hill" Hillard and her antagonist, Mr. Gaines are on their last hand of poker. If you read both books, you'll see the opening scene told from their different perspectives. From there, the two stories diverge like paths in the woods. See who wins a Gamble on Love! He was tired of gambling his life away, one lonely night after another. She was struggling to keep her family together. Maybe they could take a chance on love… together. Perceval Hillard isn’t anything like his namesake from Arthurian Legend, but the men who sit down to a poker table with him, call him “Hill.” They knew they’d likely leave with their pockets empty and a sour look on their face. He’s made a fortune over his life and lost enough to know he’s nearly done. He wants a life away from the table. That didn’t mean marriage. What woman would want a man who’d made his living shuffling a deck of cards and that he’d wasted years of his life. Faith Carver could barely remember what it was like to be happy and carefree. All her younger brothers could remember were long days and cold nights. They lost their father first and their mother to illness after that. 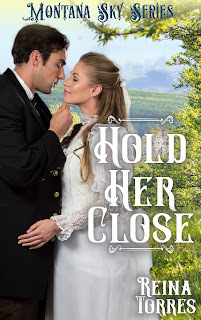 Selling off their mother’s precious collection of books has gotten them so far, but when their travels puts a strain on her brother’s health, they stop in Sweetwater Springs, and Faith needs to find a job to cover their expenses. Hill is sure he’s seeing things when he finds an angel wiping down the table at the Saloon. She was made for quiet days in a home full of things as beautiful as she is, not working until her hands are raw and red. When he finds out that Faith isn’t traveling alone, he’s surprised that he finds himself warming up to the Carver family instead of running in the opposite direction. Falling in love with an innocent like Faith might be the biggest gamble he’s ever made. When Faith decides it’s time for her and her brothers to move on, will Hill fold, or will he decide that this ready-made family is in the cards for him? When a con man comes to town, no one is safe. Penelope Clarke has had a tough go of it since her father died. She'd like nothing more than to marry the handsome rancher, Simon LeBlue, but the money for her dowry went to cover the cost of her father's funeral. Pride runs strong and she won't think about taking his name until she has the money back. Working at the saloon cleaning glasses and spittoons is not for the faint of heart, but its good honest work. If only something more respectable would turn up. Could Rupert Gaines hold the answer to her pressing needs? Simon LeBlue wants to marry Penelope Clarke more than anything in the world. In fact, he has asked her on several occasions. If only he could get her to see he doesn't care about her dowry, he just wants her. 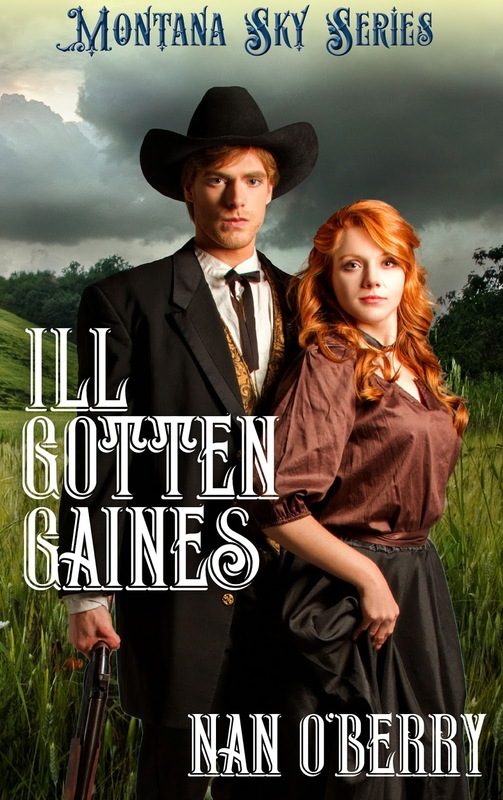 He longs to take her away from that job at the saloon. When a mysterious man comes to town, Simon's doubts begin. 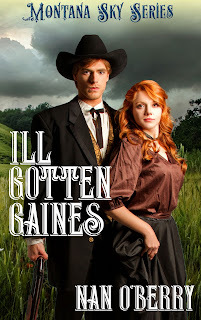 Those doubts turn into heartache when his younger sister and half the town invest in Gaines’ so-called bank, before the man disappears. To make matters worse, Penelope has been left to take the blame. Can he find this ill-gotten Gaines and bring him back to restore Penelope's reputation?